The Prophecy of Seventy Weeks (chapter 9 of the Book of Daniel) tells how a prophecy was given to Daniel by the angel Gabriel subsequent to the former's prayer that God would act on behalf of his people and city, which are respectively in exile and remain desolate within the narrative setting of this chapter. The prophecy has proved notoriously difficult for readers, despite the fact that it has been the subject of "intense exegetical activity" since the Second Temple period. For this reason scholars continue to follow Montgomery in referring to the history of this prophecy's interpretation as the "dismal swamp" of critical exegesis. It is generally accepted that chapters 1-6 in the Book of Daniel originated as a collection of folktales among the Jewish diaspora in the Persian/Hellenistic periods, and were later expanded with the more visionary material of chapters 7–12 during the persecution under Antiochus IV in 167–163 BCE. The consensus of modern critical scholarship is that the stories about Daniel and his friends are legendary, and that the eponymous hero of this biblical book "most probably never existed." There are references to a person named Daniel in earlier texts: a priest named Daniel accompanies Ezra from Babylon to Jerusalem in Ezra 8:2, a person named Daniel known for his righteousness and wisdom is alluded to in Ezekiel 14:14 and 28:3, and there is also a king named Daniel in the Ugaritic corpus. However, there is no straightforward connection between these figures and the legendary Hebrew prophet named Daniel. Gabriel. 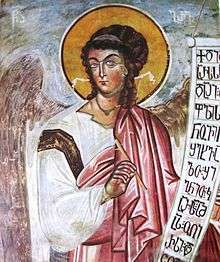 A 14th century fresco from the Tsalenjikha Cathedral by Cyrus Emanuel Eugenicus. Verses 1-2. Introduction, indicating the date and occasion (the reading of Jeremiah's prophecy). An introductory statement in vv. 3-4a describes how Daniel set himself to pray. Confession of sin (vv. 5-11a). Acknowledgement of divine punishment (vv. 11b-14), marked by the passive verb in v. 11b and the switch to God as subject in v. 12. Prayer for mercy (vv. 15-19). An introductory statement (vv. 20-21a), giving the circumstances in which the revelation occurred. The epiphany of the angel (v. 21b). The prophecy of seventy weeks of years (vv. 24-27). It is sometimes argued that Daniel's prayer in vv. 3-19 is a later addition to the chapter and, therefore, secondary. As Collins observes, it seems that the prayer was not composed by the author(s) of the rest of the chapter on the basis that it "flows smoothly, full of traditional phrases and free of Aramaisms, and it contrasts sharply with the difficult Hebrew that is characteristic of Daniel." Still, it might be that the author(s) of the chapter incorporated (or adapted) a traditional prayer in the course of composition, in which case the prayer would not be a later addition. Proponents of the view that the prayer is secondary argue that (1) the context requires a prayer of illumination and not a communal confession of sin, and (2) the beginning and end of the prayer are marked by duplications in vv. 3-4a and vv. 20-21a that are most plausibly interpreted as redactional seams. However, these considerations have not proved decisive, and arguments in favor of the prayer's authenticity have also been advanced. In particular, the concluding passage in vv. 20-27 contains several allusions to the language in the prayer, suggesting that it was included purposefully by the author(s) of the chapter, even if it was not originally composed by the same author(s). A To withhold the rebellion. B To seal up sins. C To atone for iniquity. D To bring a righteous one for the ages. E To stop vision and prophecy. F To anoint the Holy One of holy ones. F' You will discern wisdom from the departure of a word to return and rebuild Jerusalem until an anointed one is ruler. E' You will return for seven weeks and sixty-two weeks, and by the distress of the times it will be rebuilt, square and moat. D' After the sixty-two weeks he will cut off an anointed one, and the coming ruler will not have the people. C' He will destroy the holy city and its end will be by a flood, and by the end of the determined warfare there will be desolations. B' He will take away the sacrificial offering in the other week, and confirm a covenant for many in the middle of the week. A' On your base will be eighty abominations, and you will pour out for desolation until a complete destruction is determined. The seventy weeks prophecy is an ex eventu prophecy in periodized form whose Sitz im Leben is the Antiochene crisis in the second century BCE, with content analogous to the Enochic Apocalypse of Weeks as well as the Animal Apocalypse. In this way, the prophecy puts the Antiochene crisis in perspective by locating it within an overview of history; the specificity of the prediction is significant for the psychological effect of the revelation, which has long been recognized as a distinctive characteristic of Daniel's prophecies (cf. Ant. 10.11.7 §267). The prophecy is also an instance of Jewish apocalyptic literature, as it belongs to the genre of revelatory literature in which a revelation is mediated to a human recipient in Daniel by an otherworldly being in the angel Gabriel that envisages eschatological salvation. Within the macro-genre of Jewish apocalyptic literature, the prophecy further belongs to the subgenre known as the "historical apocalypse," which is characterized by the use of ex eventu prophecy and the presence of an interpreting angel. The lengthy prayer in vv. 3-19 is strongly Deuteronomic in its theology—Daniel's people are punished for their own sin and appeal to God for mercy. However, such theological overtones conflict with other aspects of the Book of Daniel, in which the primary sin is that of a gentile king and the course of history is arranged in advance. Consequently, scholars have variously argued that the angel ignores Daniel's prayer and that the author(s) is making the point that "the calamity is decreed and will end at the appointed time, quite apart from prayers," and/or that the prayer is not intended to influence God but is "an act of piety in itself." As Collins observes, "[t]he deliverance promised by the angel is in no sense a response to Daniel's prayer" since "[t]he word goes forth at the beginning of Daniel's supplication." In any case, the relationship between Daniel's prayer and the context in which it is placed is a central issue in the contemporary scholarly interpretation of chapter 9. Nebuchadnezzar II defeated Egypt at the Battle of Carchemish in 605 BCE and established Babylon as the dominant regional power, with significant consequences for the southern kingdom of Judah. Following a revolt in 597 BCE, Nebuchadnezzar removed Judah's king, Jehoiachin; and after a second revolt in 586 BCE, he destroyed the city of Jerusalem along with the Temple of Solomon, carrying away much of the population to Babylon. Accordingly, the subsequent period from 586 BCE to 538 BCE is known as the Babylonian exile. The exile ended when Babylon was conquered by the Persian king Cyrus the Great, who allowed the exiles to return to Judah via his famous edict of restoration. The Persian period came to an end in the first half of the fourth century BCE following the arrival of Alexander the Great, whose vast kingdom was divided upon his death among the Diadochi. The series of conflicts that ensued following Alexander's death in the wars that erupted among the Diadochi mark the beginning of the Hellenistic period in 323/2 BCE. Two of the rival kingdoms produced out of this conflict—the Ptolemaic dynasty in Egypt and the Seleucid dynasty in Syria—fought for control of Palestine during the Hellenistic period. At the start of the second century BCE, the Seleucids had the upper hand in their struggle with the Ptolemaic kingdom for regional dominance, but the earlier conflicts had left them nearly bankrupt. The Seleucid ruler Antiochus IV attempted to recoup some of his kingdom's fortunes by selling the post of Jewish high priest to the highest bidder, and in 171/0 BCE the existing high priest (i.e. Onias III) was deposed and murdered. Palestine was subsequently divided between those who favored the Hellenistic culture of the Seleucids and those who remained loyal to the older Jewish traditions; however, for reasons that are still not understood, Antiochus IV banned key aspects of traditional Jewish religion in 168/7 BCE—including the twice-daily continual offering (cf. Dan 8:13; 11:31; 12:11). 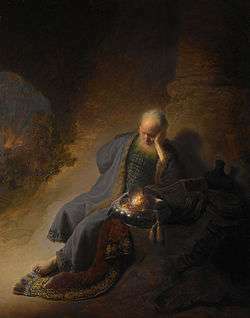 Rembrandt van Rijn, "Jeremiah Lamenting the Destruction of Jerusalem", c. 1630. The seventy weeks prophecy is internally dated within chapter 9 to "the first year of Darius son of Ahasuerus, by birth a Mede" (v. 1), elsewhere referred to within the Book of Daniel as "Darius the Mede" (e.g. Dan 11:1); however, no such ruler is known to history independently of the Book of Daniel and the widespread consensus among critical scholars is that he is a literary fiction of some kind. Nevertheless, within the fictionalized biblical account, the first year of Darius the Mede corresponds to the first year after the Babylonian kingdom is overthrown. Chapter 9 can be distinguished from the second half of the Book of Daniel by the fact that the point of departure for this chapter is another biblical text in Jeremiah's seventy years prophecy and not a visionary episode. The longstanding consensus among critical scholars has been that vv. 24-27 is a paradigmatic example of inner-biblical interpretation, in which the latter text reinterprets Jeremiah's seventy years of exile as seventy weeks of years. On this view, Jeremiah's prophecy that after seventy years God would punish the Babylonian kingdom (cf. Jer 25:12) and once again pay special attention to his people in responding to their prayers and restoring them to the land (cf. Jer 29:10-14) could not have been fulfilled by the disappointment that accompanied the return to the land in the Persian period, hence the necessity to extend the expiration date of the prophecy to the second century BCE. And just as various elements of Daniel's visionary episodes are interpreted for him in chapters 7–8, so also Jeremiah's prophecy is interpreted for him in a manner similar to the pesher exegesis evidenced at Qumran in chapter 9. However, this consensus has recently been challenged on the grounds that Daniel prays to God following the defeat of the Babylonian kingdom precisely because Jeremiah's seventy years of exile have been completed and God promised through the prophet that he would respond to such prayers at this time, in which case the seventy weeks prophecy is not a reinterpretation of Jeremiah's prophecy but a separate prophecy altogether. And these considerations have been further refined along redactional lines to suggest that the latter holds relative to an earlier "pre-canonical" stage in the text, but that the seventy weeks prophecy is, in fact, a reinterpretation of Jeremiah's prophecy relative to the final form of the text. The seventy "weeks" of years are divided into three periods of time: a seven-week period spanning forty-nine years, a sixty-two week period spanning 434 years, and a final period of one week spanning seven years. The first period of seven weeks begins with the departure of a "word" to rebuild Jerusalem and ends with the arrival of an "anointed prince" (v. 25a). This "word" to rebuild Jerusalem has generally been taken to refer to Jeremiah's seventy years prophecy and dated to the fourth year of Jehoiakim (or the first year of Nebuchadnezzar) in 605/4 BCE. Collins objects to this identification on the basis that "[t]he word to rebuild Jerusalem could scarcely have gone forth before it was destroyed" and prefers to see this as a reference to the "word" that Gabriel came to give Daniel in v. 23; other possible candidates suggested by critical scholars include the edict of Cyrus in 539/8 BCE, the decree of Artaxerxes I in 458/7 BCE, and the warrant given to Nehemiah in 445/4 BCE. The "prince" in v. 25a may refer to either an actual prince or some other figure of authority and critical scholars have proposed various candidates here as well, including Cyrus (cf. Isa 45:1), High Priest Joshua, Zerubbabel, Sheshbazzar, Ezra, Nehemiah, the angelic "prince" Michael (cf. Dan 10:21b), and even the collective people of God in the Second Temple period. Following the subsequent period of sixty-two weeks—during which time the city is rebuilt (v. 25b)—an "anointed one shall be cut off" (v. 26a); this "anointed one" is generally considered to refer to Onias III, whose death at the hands of Seleucid officials outside Jerusalem in 171/0 BCE is recorded in 2 Maccabees 4:23-28. The identification is further supported by the fact that most critical scholars see another reference to Onias III's murder in Daniel 11:22, though Ptolemy VI and the infant son of Seleucus IV have also been suggested. On the other hand, the identification of the latter "anointed one" with Onias III raises the question of how 7 + 62 = 69 weeks of years (or 483 years) could have elapsed between the departure of the "word" in v. 25a—which is not earlier than 605/4 BCE—and the murder of Onias III in 171/0 BCE. Hence, some critical scholars follow Montgomery in thinking that there has been "a chronological miscalculation on [the] part of the writer," who is then criticized for making "wrong-headed arithmetical calculations;" while others like Goldingay are not inclined to see this as a "chronological miscalculation" on the basis that the seventy weeks are not an exercise in literal chronology, but the more inexact science of "chronography." Collins opts for something like a middle-ground position in saying that "the figure should be considered a round number rather than a miscalculation." And there are still others who see the calculations as being at least approximately correct so long as the initial seven week period of forty-nine years can overlap with the sixty-two week period of 434 years, with the latter period spanning the time between Jeremiah's prophecy in 605/4 BCE and Onias III's murder in 171/0 BCE. Coin of Antiochus IV. Reverse shows the Greek god Apollo on an omphalos. The inscription ΑΝΤΙΟΧΟΥ ΘΕΟΥ ΕΠΙΦΑΝΟΥ ΝΙΚΗΦΟΡΟΥ reads, "Of Antiochus, God Manifest, Bearer of Victory." The "prince who is to come" in v. 26b is typically seen by critical scholars as a reference to Antiochus IV, though Jason and Menelaus have also been suggested. Hence, the "troops of the prince" are either thought to be the Seleucid troops that settled in Jerusalem (cf. Dan 11:31; 1 Macc 1:29-40) or the Jewish hellenizers. In any case, the reference to "troops" that will "destroy the city and the sanctuary" in v. 26b is somewhat problematic on this view since neither Jerusalem nor the temple were actually destroyed during the Antiochene crisis, though the city was arguably rendered desolate and the temple defiled (cf. 1 Macc 1:46; 2 Macc 6:2). Accordingly, it has been noted that the language of destruction "seems excessive" in this context. The "covenant" in v. 27a most likely refers to the "covenant" reported in 1 Maccabees 1:11 between the Jewish hellenizers and Antiochus IV, with the ban on regular worship for a period that lasted approximately three and a half years alluded to in the subsequent clause (cf. Dan 7:25; 8:14; 12:11). In contrast, the reference to an "abomination that desolates" in v. 27b (cf. 1 Macc 1:54) is another point of contention among critical scholars. One of the more popular older views was that this difficult phrase was a contemptuous deformation (or dysphemism) of the Phoenician deity Baal Shamin—the "Lord of Heaven"—whom Philo of Byblos identified with the Greek sky god Zeus. Moreover, the temple in Jerusalem was rededicated in honor of Zeus according to 2 Maccabees 6:2, hence the tendency among older commentators to follow Porphyry in seeing this "abomination" in terms of a statue of Zeus. More recently, it has been suggested that the reference is to certain sacred stones (possibly meteorites) that were affixed to the great altar of sacrifice for the purposes of pagan worship in the temple, since the use of such stones is well-attested in Canaanite and Syrian cults. However, both sorts of proposals have been criticized on the basis that they are either too speculative, dependent on flawed analysis, or not well-suited to the relevant context in the Book of Daniel. Increasingly, critical scholars tend to see the expression as being a reference to either the pagan offerings that were given during the Antiochene crisis instead of the twice-daily continual offering that had been forbidden (cf. Dan 11:31; 12:11; 2 Macc 6:5), or the pagan altar on which such offerings were made. Francesco Albani's 17th century Baptism of Christ is a typical depiction with the sky opening and the Holy Spirit descending as a dove. The seventy weeks prophecy has frequently not been read as an ex eventu prophecy whose Sitz im Leben is the Antiochene crisis in the second century BCE, but as a messianic prophecy concerning the future arrival of a certain individual who would be anointed by God to bring salvation for his people that was revealed to Daniel by the angel Gabriel in the sixth century BCE. Accordingly, those who read the prophecy this way rarely follow historical-critical scholars in seeing the Book of Daniel as a combination of legendary folktales and other visionary episodes that belong to the literary genre of Jewish pseudepigrapha, but as a series of ancient Near Eastern court tales and other revelatory episodes that actually took place in the sixth century BCE and are faithfully recorded as such in the biblical text. On this understanding, the prophecy has more in common with the genre of Old Testament prophecy in developing the ancient Jewish/Christian eschatological hope of a future messianic age in which the promised Davidic king will preside over an era of worldwide peace, prosperity, and enduring righteousness. This way of reading the prophecy has given rise to a rich tradition of Christian theological speculation beginning with the early church fathers in which the prophecy is understood to be a prediction involving the coming of Christ in Jesus of Nazareth. Crucifixion of Jesus of Nazareth, 12th century medieval illustration from the Hortus deliciarum of Herrad of Landsberg. Generally speaking, the various christological readings that have been proposed share a number of features in common. Either the "anointed prince" in v. 25a or the "anointed one" in v. 26a (or both) are understood to be references to Christ, who is also sometimes thought to be the "most holy" thing that is anointed in v. 24 (so the Peshitta and the Vulgate). Some of the early church fathers also saw another reference to Christ in the "prince who is to come" (v. 26b), but this figure is more often identified with either the Antichrist or one of the Roman officials that oversaw the destruction of Jerusalem in 70 CE (e.g. Titus or Vespasian). The seven and sixty-two week periods are most frequently understood as consecutive, non-overlapping chronological periods that are more or less exact in terminating with the time at which Christ is anointed with the Holy Spirit at his baptism, with the terminus ad quo of this 483-year period being the time associated with the decree given to Ezra by Artaxerxes I in 458/7 BCE. The reference to an anointed one being "cut off" in v. 26a is identified with the death of Christ and has traditionally been thought to mark the midpoint of the seventieth week, which is also when Jeremiah's new "covenant" is "confirmed" (v. 27a) and atonement for "iniquity" (v. 24) is made. The "abomination that desolates" is typically read in the context of the New Testament references made to this difficult expression in the Olivet Discourse and understood as belonging to a complex eschatological tableaux described therein, which may or may not remain to be fulfilled. Dispensationalist christological readings are notable in deviating from this general pattern in a number of ways that are worth mentioning. These readings have the warrant given to Nehemiah in 445/4 BCE as the terminus ad quo, but since 483 years from 445/4 BCE would extend somewhat beyond the lifetime of Christ to 39/40 CE these years are reduced to 476 years by viewing them as 360-day "prophetic" years, which are so-called on the basis that various biblical passages—such as Revelation 12:6, 14 (cf. Dan 7:25; 12:7)—suggest that there was a convention for reckoning time in this way within certain prophetic contexts. Consequently, the sixty-nine weeks of "prophetic" years terminate with the death of Christ in 32/3 CE. The seventieth week is then separated from the sixty-ninth week by a long period of time known as the church age; hence, the seventieth week does not begin until the end of the church age, at which point the church will be removed from the earth in an event called the rapture. Finally, the future Antichrist is expected to oppress the Jewish people and bring upon the world a period of tribulation lasting three and a half years, constituting the second half of the delayed seventieth week. These readings were first popularized through the expository notes written by C. I. Scofield in his Scofield Reference Bible and continue to enjoy widespread support among American evangelicals. ↑ Tanner 2009a, p. 181. ↑ Segal 2011, p. 293 n. 31. ↑ Montgomery 1927, p. 400. ↑ Athas 2009, p. 2. ↑ Collins 1993, pp. 35-37. ↑ Collins 1993, pp. 60-61. ↑ Collins 1993, p. 1. ↑ Gibson 1977, pp. 103-22. ↑ Collins 1993, pp. 1-2. 1 2 3 4 5 Collins 1993, p. 347. ↑ Gall 1895, pp. 123-26. ↑ Hartman & Di Lella 1978, pp. 245-46. ↑ Montgomery 1927, p. 362. ↑ Goldingay 1989, p. 237. ↑ Collins 1993, p. 348. ↑ Segal 2011, p. 294 n. 32. 1 2 Waters 2016, pp. 97-107. ↑ Waters 2016, pp. 110-111. ↑ Waters 2016, pp. 98-100. 1 2 3 4 5 Collins 1993, p. 359. 1 2 3 Collins 1993, p. 360. ↑ Waters 2016, p. 98 n. 15. 1 2 Collins 1993, pp. 54-55. ↑ Jones 1968, p. 493. ↑ Towner 1971, p. 213. ↑ Collins 1993, pp. 359-60. ↑ Levine 2010, p. 173. ↑ Levine 2010, p. 36. ↑ Levine 2010, pp. 25-26. ↑ Lust 2002, pp. 672-73. ↑ Rowley 1935, pp. 12-66. ↑ Segal 2011, p. 289. 1 2 Waters 2016, p. 97. 1 2 Segal 2011, p. 283. ↑ Grabbe 1987, pp. 67-72. ↑ Segal 2011, p. 284. ↑ Bergsma 2006, pp. 212-25. ↑ Segal 2011, pp. 288-92, 302. ↑ Montgomery 1927, p. 391. ↑ Segal 2011, p. 293. ↑ Koch 1980, p. 150. 1 2 Collins 1993, p. 354. ↑ Collins 1993, pp. 354-55. ↑ Hess 2011, p. 317. 1 2 Waters 2016, pp. 100-101. 1 2 3 Redditt 2000, p. 238. ↑ Goldingay 1989, p. 260. ↑ Delcor 1971, p. 144. 1 2 3 Waters 2016, p. 106. 1 2 Collins 1993, p. 355. 1 2 Nel 2013, p. 4. ↑ Athas 2009, p. 16. ↑ Ulrich 2014, p. 1071. ↑ Segal 2011, pp. 297-302. ↑ Waters 2016, p. 102. ↑ Meadowcroft 2001, pp. 440-49. ↑ Redditt 2000, pp. 238-39. ↑ Athas 2009, pp. 9-12. ↑ Collins 1993, p. 382. 1 2 3 4 Seow 2003, p. 150. ↑ Goldingay 1989, p. 299. ↑ Montgomery 1927, p. 393. ↑ Porteous 1965, p. 134. ↑ Goldingay 1989, pp. 257-58. ↑ Segal 2011, p. 298. ↑ Collins 1993, p. 356. ↑ Athas 2009, pp. 16-17. 1 2 Goldingay 1989, p. 262. 1 2 3 4 Collins 1993, p. 357. 1 2 Hess 2011, p. 328. ↑ Towner 1984, p. 143. ↑ Waters 2016, pp. 106-107. ↑ Lust 2002, p. 683. ↑ Lust 2002, pp. 674. ↑ Lust 2002, pp. 677-78. ↑ Porteous 1965, p. 143. ↑ Goldstein 1976, pp. 144-51. 1 2 3 Collins 1993, p. 358. ↑ Lust 2002, pp. 675-82. ↑ Lust 2002, pp. 682-87. ↑ Waters 2016, p. 107. ↑ Goldingay 1989, p. 263. ↑ Ross 1996, p. 30. ↑ Shea 1991, pp. 115-16. ↑ Walvoord 1971, pp. 201-37. ↑ Tanner 2009b, pp. 319-20. 1 2 3 4 Doukhan 1979, pp. 2-3. ↑ Tanner 2009a, pp. 198-200. ↑ Tanner 2009a, p. 198. ↑ Shea 1991, pp. 136-37. ↑ Payne 1978, p. 101. 1 2 Hess 2011, p. 322. ↑ Hoehner 1978, pp. 136-37. 1 2 Doukhan 1979, p. 2. ↑ Hoehner 1978, p. 141. ↑ Hess 2011, p. 321. Athas, George (2009). "In Search of the Seventy 'Weeks' of Daniel 9" (PDF). Journal of Hebrew Scriptures. 9. doi:10.5508/jhs.2009.v9.a2. Bergsma, J. S. (2006). The Jubilee from Leviticus to Qumran. Supplements to Vetus Testamentum. 115. Brill. doi:10.1163/ej.9789004152991.i-353. Collins, John J. (1993). Cross, Frank M., ed. Daniel: A Commentary on the Book of Daniel. Hermeneia. Fortress Press. Delcor, Mathias (1971). Le Livre de Daniel. Sources Bibliques. Gabalda. Doukhan, Jacques (1979). "The Seventy Weeks of Daniel 9: An Exegetical Study". Andrews University Seminary Studies. 17 (1): 1–22. Gall, August Freiherr von (1895). Die Einheitlichkeit des Buches Daniel: eine Untersuchung. Walter De Gruyter Inc.
Gibson, J. C. L. (1977). Canaanite Myths and Legends. Academic Paperback Series (2nd ed.). T&T Clark. Goldingay, John (1989). Watts, John D.; Watts, James W.; Metzger, Bruce M., eds. Daniel. Word Biblical Commentary. 30. Thomas Nelson. Goldstein, Jonathan A. (1976). I Maccabees. The Anchor Yale Bible. 41. Doubleday. Grabbe, Lester L. (1987). "'The End of The Desolation of Jerusalem': From Jeremiah's 70 Years to Daniel's 70 Weeks of Years". In Evans, Craig A.; Stinespring, William F. Early Jewish and Christian Exegesis: Studies in Memory of William Hugh Brownlee. Homage Series. Scholars Press. Hartman, Louis Francis; Di Lella, Alexander A. (1978). The Book of Daniel. The Anchor Yale Bible. 23. Doubleday. Hess, Richard S. (2011). "The Seventy Sevens of Daniel 9: A Timetable for the Future?" (PDF). Bulletin for Biblical Research. 21 (3): 315–30. Hoehner, Harold W. (1978). Chronological Aspects Of The Life Of Christ. Zondervan. Jones, Bruce William (1968). "The Prayer in Daniel Ix". Vetus Testamentum. 18 (1): 488–93. doi:10.1163/156853368X00375. Koch, Klaus (1980). Das Buch Daniel. Erträge der Forschung. 144. Wissenschaftliche Buchgesellschaft. Laato, Antti (1990). "The Seventy Yearweeks in the Book of Daniel". Zeitschrift für die alttestamentliche Wissenschaft. 102 (2): 212–25. doi:10.1515/zatw.1990.102.2.212. Levine, Amy-Jill (2010). "Daniel". In Coogan, Michael D.; Brettler, Marc Z.; Newsom, Carol A.; et al. The New Oxford Annotated Bible with Apocrypha: New Revised Standard Version (4th ed.). Oxford University Press. Lust, Johan (2002). "Cult and Sacrifice in Daniel. The Tamid and the Abomination of Desolation". In Collins, John J.; Flint, Peter W. The Book of Daniel: Composition and Reception. Supplements to Vetus Testamentum. 83/2. Brill. doi:10.1163/9789004276093_019. Meadowcroft, Tim (2001). "Exploring the Dismal Swamp: The Identity of the Anointed One in Daniel 9:24-27". Journal of Biblical Literature. 120 (3): 429–49. doi:10.2307/3267901. Montgomery, James A. (1927). A Critical and Exegetical Commentary on the Book of Daniel. T&T Clark. Nel, Marius (2013). "Daniel 9 as part of an apocalyptic book?". Verbum et Ecclesia. 34 (1): 1–8. doi:10.4102/ve.v34i1.707. Payne, J. Barton (1978). "The Goal of Daniel's Seventy Weeks" (PDF). Journal of the Evangelical Theological Society. 21 (2): 97–115. Porteous, Norman W. (1965). Daniel: A Commentary. The Old Testament Library. Westminster John Knox Press. Redditt, Paul L. (2000). "Daniel 9: Its Structure and Meaning". Catholic Biblical Quarterly. 62 (2): 236–49. Ross, Leslie D. (1996). Medieval Art: A Topical Dictionary. Greenwood. Rowley, H. H. (1935). Darius the Mede and the Four Empires in the Book of Daniel: A Historical Study of Contemporary Theories. University of Wales Press. Segal, Michael (2011). "The Chronological Conception of the Persian Period in Daniel 9". Journal of Ancient Judaism. 2 (3): 283–303. doi:10.13109/jaju.2011.2.3.283. Seow, Choon-Leong (2003). Daniel. Westminster Bible Companion. Westminster John Knox Press. Shea, William H. (1991). "When did the Seventy Weeks of Daniel 9:24 Begin?". Journal of the Adventist Theological Society. 2 (1): 115–38. Tanner, J. Paul (2009a). "Is Daniel's Seventy-Weeks Prophecy Messianic? Part 1" (PDF). Biblotheca Sacra. 166: 181–200. Tanner, J. Paul (2009b). "Is Daniel's Seventy-Weeks Prophecy Messianic? Part 2" (PDF). Biblotheca Sacra. 166: 319–35. Towner, W. Sibley (1971). "Retributional Theology in the Apocalyptic Setting". Union Seminary Quarterly Review. 26: 203–14. Towner, W. Sibley (1984). Daniel. Interpretation: A Bible Commentary for Teaching and Preaching. John Knox Press. Ulrich, Dean R. (2014). "How Early Judaism Read Daniel 9:24-27". Old Testament Essays. 27 (3): 1062–83. Walvoord, John F. (1971). Daniel: The Key to Prophetic Revelation. Moody Press. Waters, B. V. (2016). "The Two Eschatological Perspectives of the Book of Daniel". Scandinavian Journal of the Old Testament. 30 (1): 91–111. doi:10.1080/09018328.2016.1122292. McFall, Leslie (2009). "Do the sixty-nine weeks of Daniel date the messianic mission of Nehemiah or Jesus?" (PDF). Journal of the Evangelical Theological Society. 52 (4): 673–718. Rodriguez, Angel Manuel (1994). "The 70 Weeks and 457 B.C.". Biblical Research Institute. Zuiddam, Benno A. (2013). "The Shock Factor of Divine Revelation: A Philological Approach to Daniel 8 and 9". Scandinavian Journal of the Old Testament. 27 (2): 247–67. doi:10.1080/09018328.2013.851515.